IR 750 NHS Ester (IRDye® 750 NHS Ester analog) is a water-soluble, bright, near-IR fluorescent dye that is spectrally similar to other 750 dyes used for flow cytometry, microscopy and other applications. 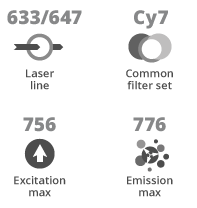 IR 750 conjugates ideally suited for the 633 nm laser lines or dye-pumped laser. 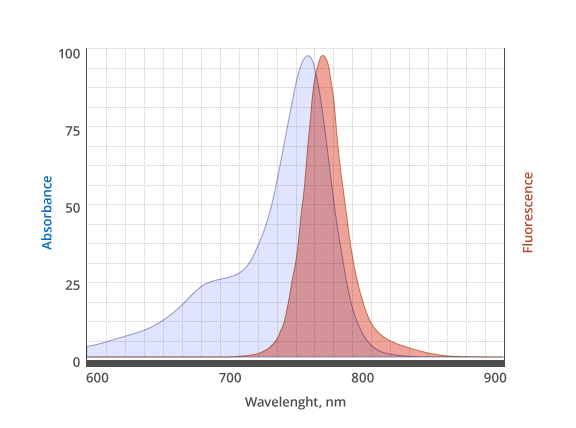 A significant advantage to using long wavelength dyes such as Cy7® Dye or Alexa Fluor® 750 dye over other fluorophores is the low autofluorescence of biological specimens in this region of the spectrum. The NHS ester (or succinimidyl ester) is the most popular amine reactive group for labeling with the primary amines of proteins (Lys), amine-modified oligonucleotides, and other amine-containing molecules. Proteins can be labeled with IR 750 NHS Ester at high molar ratios without significant self-quenching, leading to brighter conjugates and more sensitive detection. IR 750 conjugates are is pH-insensitive over a wide molar range, helping ensure that you get stable signals in imaging and flow cytometry applications.